Who’s up for some yummy Nascar Meats? I don’t know which is better here, the product name or the tagline. 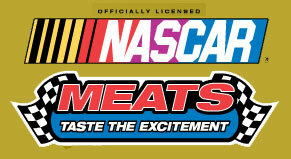 Yes, officially licensed Nascar Meats are coming to a grocery store near you, and can’t you just “Taste the excitement”? No roadkill. No beef jerky. Just jumbo hot dogs (aka tube steaks), bacon and smoked sausage. When can we expect the Motocross Cheeses?